Ad Extensions is a feature through which advertisers can show additional business information such as address, phone number, etc. Google Ads offers two types of ad extensions; Automatic extensions and Manual extensions. Automated ad extensions are those that Google adds to an ad copy if that extension is predicted to improve the ad’s performance. Manual ad extensions are those extensions that advertisers need to set based on their business requirements. While both types of ad extension serve almost the same purposes, manual extensions offer customisation flexibilities to the advertiser. Automated extensions are based on the existing data and optimisation which advertisers have no control over. Click count Increment: Ad Extensions increase the physical size of your ads on the results page. Your ads are more visible with useful information. These enlarged ads are attractive and can persuade users to click. Click-through Rate Enhancement: Clickthrough Rate is an important metrics for online ads. The better the clickthrough rate, the higher are the chances of conversions. Ads with extensions are found to have a higher clickthrough rate than ads without extensions. And ads with multiple extensions perform better than ads with a single extension. Ad Rank Improvement: Google Ads Extensions have a direct impact on the rank of the ads. When calculating Ad Rank, Max CPC and Quality Score are considered along with the expected result of ad extensions and formats.This has also been confirmed by Google. Higher chances of Conversions: With ad extensions in place, not just the click count increases, but also the click quality. Ads with extensions allow users to make a well-informed click. And the users who get to the landing page are most likely to make a purchase. Quality Score Boost: An increase in the click count and an enhanced click-through rate lead to a chance of better conversion rate. These facts improve the ad rank by boosting the Quality Score of keywords. Learn how to boost the Quality Score of Keywords. Ads without Google Ads Extensions are often incomplete.They might either convey a lot less sense leading to scarce conversions or incur very high cost-per-conversion rendering them unprofitable. Ad extensions are free fixes to improve ads and related conversions. However, it is essential to use the extensions with caution. A misplaced extension or an extension with a weak message might have an adverse effect. Therefore, the threat of losing potential customers and money exists. In the best interest to avoid these risks, please follow the below mentioned best practices. Define your goal: Defining a purpose comes first every time. Before you implement ad extensions, figure out what kind of growth/goals you want to achieve. Understand all the extensions: Once your goals are set, you can now research and acquire in-depth knowledge of different types of extensions. This exercise will help you figure out how these extensions work and how they can help you achieve your goals. Choose the best: Never spam extensions on an ad copy. Choose the one that fits your requirements first. Implement it. And let it work its wonders. Performance and review: Once you have implemented your first ad extension, track its performance and review it with your historical data. Note down the changes. Analyse how these changes are affecting your campaign. Multiple extensions: Using various extensions is better than using a single extension. But before you go with your second extension, be sure to audit the performance of your first extension. Always make calculated decisions that are backed by data, not just intuitions. App extensions allow you to add an app download button to your search ads. Create a remarketing list of visitors who used mobile devices. App extensions don’t make sense for users on desktops. Also make sure that your app is both iOS and Android compatible. Otherwise, it will lead to a bad user experience when the app download fails. Likewise, have both iOS and Android conversion tracking enabled. Your thumbnail and name on the extension should be vivid and legit. A dull ad copy raises questions of trust among users. Use an innovative and catchy call-to-action instead of download now. Because the market is saturated with millions of ads, standing out is the best way to win customers. How to enable App Extensions? Call extensions allow you to add your business phone number to your search ads. Avoid using call extensions on keywords under broad or modified broad match type. Use call extensions on keywords under phrase and exact match types. This is to ensure that the user is ready to make a phone call as their searches match your keywords. Set up Ad Scheduling. This is to make sure that your ads with call extensions trigger only when you are available to take calls. You can also use call-only campaigns for better results as call-only campaigns are a part of mobile-only campaigns. Your ads will be shown only to users who are on mobile devices. Hence, leading to a better chance of conversion. Set up call conversion tracking to monitor the performance of the ads with call extensions enabled. How to enable Call Extensions? Callout extensions allow you to include additional business information. Use this space to provide unique selling points of your business to attract customers to click on your ads. Callouts work best for keywords under broad match as these keywords get triggered for searches that aren’t specific. And such users can be nourished and be converted into potential customers by educating them with callouts. You can also create different callouts based on the search terms and choose which callout appears for a specific search term. This attribute gives users a sense of personal touch and improves the chances of clicks. It is best to highlight generic business information as your target audience will be a broad spectrum. How to enable Callout Extensions? Location extensions allow you to include your physical store location. 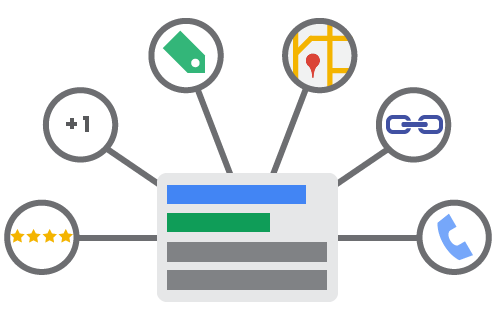 Google Ads location extensions are highly helpful in increasing visitors to your brick-and-mortar store. You can also combine location extensions with geo (radius) targeting and location-based bid adjustments to show ads to those people who are near your store. Location extensions are not just limited to increasing first-time visitors. You can club it with callout extensions to prompt users to avail in-store returns or in-store trials. Including a location extension also helps boost the legitimacy of your ad copies as well as your business. It always helps users trust you when you give them a chance to visit their shop physically. How to enable Location Extensions? Price extensions allow you to include prices of various products/services you offer. Using price extensions, you can showcase your product prices along with your ads on the search results page itself. If you have a better pricing than your competitors, you have won customers even before they clicked on your ads. Smooth, isn’t it? Price extensions might be a problem if your products are priced high. It might reduce your clickthrough rate initially. However, your conversion rate would improve. With price extensions, you have the flexibility to update them regularly without breaking a sweat. You don’t need to create new texts for new products. Instead, you can just change the name, and description on the existing price extension enabled ads. How to enable Price Extensions? Using review extensions you can share user feedbacks, awards or other such write-ups. Review extensions also have the potential to drive users to click on your ads. And not just that, they make your ad copies beautiful attracting more clicks. It is best to use review extensions with your broad match keywords. Because, it is challenging to generate keyword-specific reviews. You can also use review extensions along with radius targeting and location-based bidding to make the most. You can target those people who are near your store, and the reviews can attract them to visit your shop. How to enable Review Extensions? Sitelinks are links to various pages of your website that you can add to your ads. You can have your own text describing the link and the URL that redirects to specific pages on your website. You can use call-to-action texts or informative texts to persuade users to visit different pages. Sitelink extensions best go with broad match keywords. This gives you a scope of wider audiences. You can also update the text or the URL anytime you want without actually having to redesign the ad copy. This also means that your data is intact. It doesn’t reset. And, you can also schedule your site link extensions for specific dates of the month, days of the week, time of the day, etc. You can highlight specific aspects of your products or services using structured snippets. Structured snippets, when done right, add a lot of value to your ad copies. You can also provide relevant information that your users who like to know. Google offers predefined headers you can choose from. And then you add your message (value). Up to two headers show on desktop ads and one header on mobile ads. Google Ads Extensions are a free way to improve the Quality Score of keywords. Not just that, using Google Ads extensions wisely has helped many advertisers achieve exponential growth in Return-on-Investments. What are you waiting for? Extend your ads already!